Home > The Cape Kitchen > What's For Breakfast? What's for breakfast ? 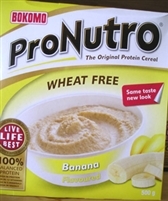 and in South Africa that would normally be Pronutro, Mealie Meal, Maltabela or Weetbix so lets first start with Pronutro, developed in South Africa in the 1960's this unique cereal has to be the healthiest cereal on the planet! 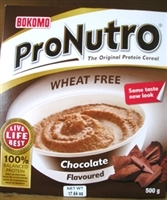 The main component of Pronutro Original is soy and it is wheat free with the exception of the whole wheat version, this is a 100% balanced protein cereal which only requires the addition of milk or water, we stock the Original version along with Pronutro Chocolate, Pronutro Banana and also Pronutro Whole Wheat. We then have that staple diet of Southern Africa which is called Mealie Meal, or Mieliepap, or Maize Meal or Mielie Meel or Sudza, or just plain pap, it suppose it just depends where you live in Southern Africa. Made from ground white corn and similar to grits or polenta but different in flavor and texture the low cost food is popular allover the southern half of the continent, and is very popular when prepared with a very dry constituency (Stywepap) and then served with boerewors and topped with a tomato and onion relish, This dish is called Pap en Wors! 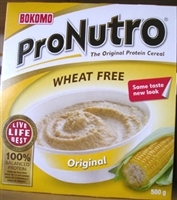 and very popular in the Northern areas of South Africa. Maltabela is a creamy and malt flavoured version of mealie meal and served hot with milk for breakfast. Last but not least is Weetpix or Weetabix (The British version) This is cereal which has been around in South Africa since the 1930's and is only produced in Britain and South Africa. made from coarse whole wheat which is formed in a wafer like shape and is served with hot or cold milk, zero sugar and an incredible source of fiber. All of these South African breakfast cereals unlike US cereals have an exceptionally low sugar content and that speaks for itself when one is looking for a healthy breakfast.